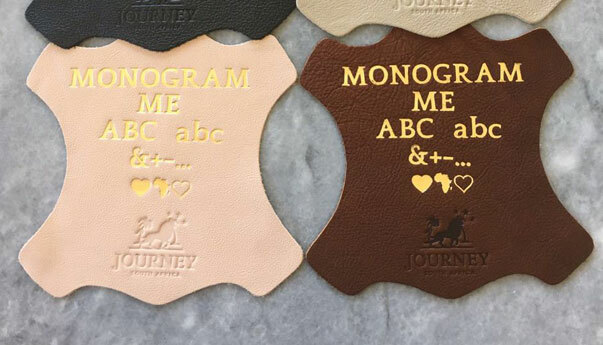 Adding your initials to your JOURNEY purchase will make it your very own heirloom. Allow us to enhance your beautiful Journey piece with gold, silver or blind (plain stamped) embossed initials. Our letters are individually cast within our studio in Cape Town. Items can be stamped up to four letters/initials in length. If you wish to have more than four letters/initials personalised onto your purchase, please note that this will be at an additional charge of for up to 8 letters/symbols *if your item allows. Please contact us via email at journeysouthafrica@gmail.com if you have any special personalisation requests. We offer both Upper and Lower case letters, so please take care when reviewing and confirming your personalisation request. Please note that we cannot accept returns on personalised merchandise. Please insert text/symbols below when requesting your monogram. *The position of the monogram can be found within the product details. Journey fine leather collection is made using the very finest African leathers. Our classic and timeless designs are finished off with simple gold and silver embellishments which enhance the beauty of the leather. Our designs are classic and simple, and made to be worn for years to come. We offer monogramming on all of our products as this personalised touch adds to our unique and beautiful collection. 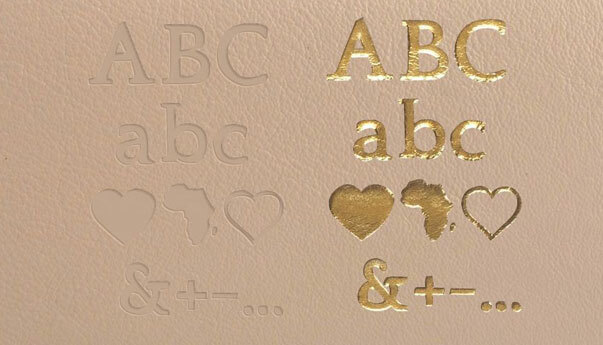 You may choose between gold, silver or plain embossing for your personalised details depending on if the product allows. If your selected product does not however allow for silver or gold personalisation, plain embossing is the perfect finish for your item. Our range is soft and high quality for long lasting luxury. Journey Fine leather collection specialises in offering beautifully hand crafted South African goods that are timeless, luxurious and usable for everyday wear.